It's a story of David vs Goliath, but in this version Goliath has rather cruelly crushed little David. Apple has closed down a Kickstarter project by refusing to licence its Lightning charger. So now the POP portable charging station won't see the light of day, and the technology and design lab behind it has to return the $139,170 in funding it received on the crowd-sourcing website. 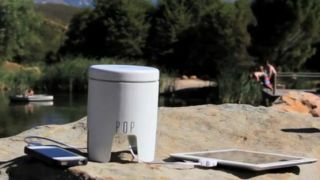 The POP was going to be a portable charger that let you juice up your Apple device, among other phones and tablets. Apple, not happy with its iPhones and iPads sharing the stage with rivals, didn't licence its Lightning dock, and so the team have had to abandon the project. The team at Edison Junior, the company behind the POP, are understandably annoyed, and aren't shy about letting it be known. "We are pissed," CEO Jamie Siminoff told VentureBeat. "I think they are being a bunch of assholes, and I think they're hurting they're customers." Edison Junior will have to foot the fees from credit cards as well as the Kickstarter charges. In total, that amounts to more than $11,000. "We would have loved to have made the product," Siminoff said. "At the same time I feel like we're making the correct decision… I'm not willing to compromise on the product." He guaranteed all backers would get their donations back in full. And he had a word of warning for Apple over its business practices. "When you do things that are bad for the customer… I think it will be bad for them," he said.